Composite Multicolor material is fragile, it cannot withstand large falls or wetness. Technical specifications on the material. Our composite multicolor prints leave the printer fully colored, using a fine powdered material that resembles sandstone. The sandstone material is painted and adhered during the printing process. As the material is painted during the process, the file uploaded to the sculpteo website must also contain the texture information. For more information, refer to our section about file formats . We are able to print in 390,000 different colors. Composite Multicolor prints are thus the most rapid and economic way to arrive at a full colored object. Objects printed in composite multicolor can withstand temperatures of up to 60°C (140°F) - beyond that the object’s properties can be significantly altered. Composite Multicolor objects are also somewhat fragile (comparable to a porcelaine), so it is important to handle them with caution. The prints have a gritty surface and are relatively porous. It is thus important to avoid direct contact with water as it could result in discoloration or running of the colors. The printing price of your design is calculated automatically the moment it is placed online. As you modify your object (changing size, using hollowing feature, etc.) you will note that the price changes automatically. The pricing is based on a series of factors, including: volume of material used, size of object, and multiple other factors. To see your price in just a few clicks you just need to upload your 3D file . We estimate our composite multicolor prints will be shipped within 2-4 days after the order is placed. An additional day or two is may also be required depending on the finishing options you choose. In some outstanding cases, the print can take more time to be shipped - this is usually depends on the volume of prints being processed. The exact shipping estimate will be given upon checkout. From there the delivery time is up to you. There are multiple shipping options you can choose which vary in price depending on the urgency. Before printing your object you must create a 3D model using a program dedicated to 3D modeling. Two files must then be exported from the program, one with the physical shape and size of your object, the other with the texture and color details. Those two files can be uploaded to our website in the same .zip file. Your 3D model and texture details are then sent to our 3D printers and arranged within the next available batch. For composite multicolor prints, that batch will be in one of our ZPrinter 650s by 3D Systems. The print itself is carried out layer by layer. A rolling batch leaves a uniform layer of the sandstone-like powder. From there two printing heads pass over the batch, coloring and adhering the object at the same time. The batch of powder then makes another pass, until the object is completed. The objects are then carefully removed by hand from the batch. The excess powder from the print is saved for a future print. The excess bits of powder which can not be removed by hand are removed with pressurized air. The object is then dunked in a cyanoacrylate bath, which further solidifies the object and brings out the colors a bit more. Finally your object is given an anti-UV varnish to protect it from extensive light exposure. If you choose other varnishing options for your object, they would be applied at this stage. 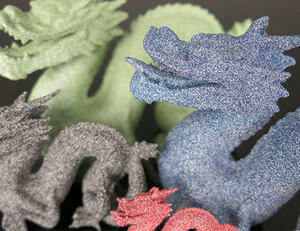 Composite Multicolor is the only material which can 3D print in full color. 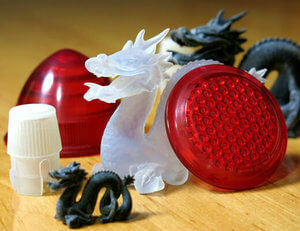 This makes it the perfect material for figurines, avatars, 3D-scans, or anything that require full color. The material is as solid and breakable as porcelain, so it is important to use caution when handling or transporting your object. Given its fragile nature, the material serves most effectively for ornamental objects, that aren’t handled much. As stated earlier, the object can handle temperatures of up to 60°C (140°F). Subject your object to temperatures higher than that will have a negative effect on its stability. Water contact should also be avoided: any contact with water has the ability to have an effect on the object. Raw: the object is only cleaned of excess powder. This finishing leaves a grainy, rough surface. Matte Varnish: the object is coated with a layer of varnish. This increases its resistance to humidity, water, and tumblings. This option leaves a matte finish. Since the color of the object is printed directly onto the piece, you must upload a file that includes both the volume and texture information. This can be done by grouping the two files (volume and texture) into the same .zip file. It will then be the .zip that you will upload to our website , which is able to interpret all of the information within them. The texture file can include any of the visible colors at a finesse of 600 x 540 PPI, however small differences in particular colors may appear between the objects you print, such as blacks and flesh colors. This is a result of the shape of your object and the pigment we use in our prints. Our 3D printer, the ZCorp ZPrinter 650, allows us to print with a layer thickness of 100µm (0.1mm). The maximum dimensions of your models are limited by the physical size of the printer itself. Your designs must respect the maximum print size in order to be printed. In order to be printed, the composite multicolor object must also correspond with the minimum size of 2 x 2 x 2 mm. The walls of your object must be thick enough to withstand the printing and extraction that the object will go through. They also must be thick enough to bear the weight of the object itself. We highly recommend creating an object with walls that are thicker than the minimum. If the walls are smaller than 2mm, it is always preferable to modify the design. For example, if you are modelling a bust of a person, you can attach thin aspects of the design like the ears in more places around. Doing that will avoid cantilevered and easily breakable elements in the final print. A stemmed element is a design aspect which is at least twice as long as it is thick. For unsupported and stemmed elements or parts of the design with a particular design constraint, it is also important to respect a minimum thickness of 3 mm in order to guarantee the object will not break. Sculpteo offers an online solidity check tool which highlights parts of the print that may be too thin for a print. From there you are able to tweak your design in order to create an object that is an appropriate thickness. To use it, you just need to upload your 3D file, select your material and click on “Verification” tab. Keep in mind that composite multicolor material is fragile: thin unsupported parts such as less than 1mm hair or spikes may not be printed or can break while removing powder. We recommend to thicken them or to add supports. It is possible to add a support structure to maintain stability. For example, if you are modelling a bust of a person, you can attach thin aspects of the design like the ears in more places around the model’s head. Doing that will avoid cantilevered and easily breakable elements in the final print. As the composite multicolor material is particularly fragile, it is not possible to include enclosed volumes without running the high risk that they will break. Our 3D prints require a minimum space between fixed walls. This minimum space allows the excess powder to be cleared from between the design aspects. The ZCorp mineral powder can can stick two walls together if there is not enough clearance between them. For this a minimum space of at least 0.9 mm between walls is required. Reaching deep areas is more difficult while cleaning and gluing. For this reason, the deeper the object is the bigger empty space should be. Composite Multicolor 3D prints cannot be printed fully assembled. It is, however, possible to print parts to assembled after 3D printing. To do so, it is necessary to leave space between the different parts of the object. The amount of space you plan on leaving depends on the object’s intended use. For larger pieces that require a lot of movement, more space is necessary. If you’re looking for a piece with more limited movement, steer closer to the 0.4 mm minimum in spacing between the objects. 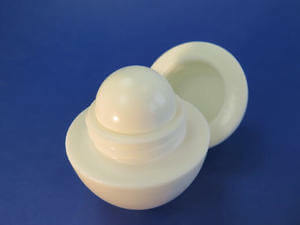 More commonly, such as the a teapot’s cap, a difference of 0.9 mm is required to create a removeable and fully functional top. Our online hollowing optimization tool has the ability to greatly reduce the price of a print by reducing the amount of material used. Using the tool requires adding two holes to your model, which will serve as the drain for the excess powder material within the object. The minimum size of these holes is determined by our website. Otherwise it is possible to hollow your object manually in your 3D modeling software. It is not possible to 3D print a 3D file containing several objects with our 3D composite multicolor printers. It is not possible to print a 3D file containing several objects, that's why we cannot accept files that contain clusters of multiple objects . You can also use our online tools and see our tricks and tips on how to reduce your 3D printing price. 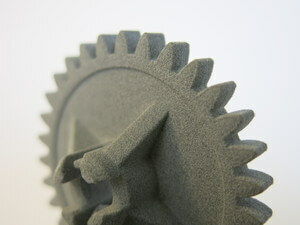 To get more information on our additive manufacturing service, you can contact our qualified sales team.